5. Our metal safety scrapers are sold in units of one hundred scrapers, but are handy tools that stand-alone. 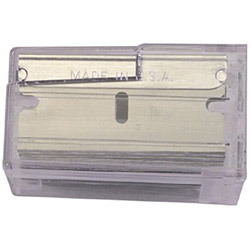 These all-purpose scrapers are retractable and use the traditional single edge razor blade, something the customer probably already has. The metal design is sturdy and well built to easily change out blades while holding up to heavy duty scraping tasks. A great product to keep in a bin so they can test out the locking mechanism and grab some to go. 4. Our plastic scraper is the counterpart to the metal safety scraper. These plastic scrapers and sold in boxes that pop open ready for retail. Each mini scraper comes with a single blade and holder suitable to cleaning and scraping surfaces where metal would scratch. Un-stick old gum, bird droppings, paint and stickers with this handy tool. 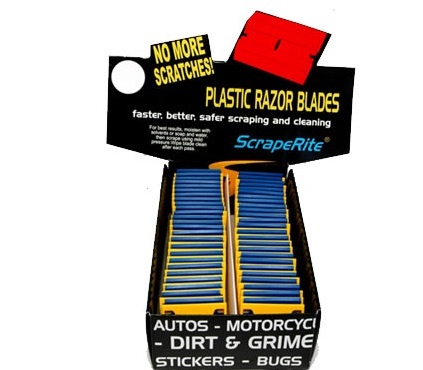 The plastic refill blades can also be sold in hundred packs for when customers come back for more. 3. Utility knifes are easy to lose but handy to have around. Feature some inexpensive but well made utility knives such as our die cast utility knife for quick replacements on the go. Fully retractable and lockable for safety, the knife also features blade storage in the handle. 2. Breakaway knives or snap-off knives are another handy cutting tool. Our brightly colored and individually wrapped snap-off tools are feature in both 13 pt and 8 pt models. The plastic knives are inexpensive so while they can be re-filled, it’s easy to grab a new knife when your old one is done. 1. Finally these handy 10 pack dispensers of GEM razor blades are perfect for customers who just need a quick refill of single edge blades. Featuring our stainless steel uncoated razors, the quality of the blade will not disappoint. These handy little dispensers are safe to use and convenient to buy. Check out more recommendations of products stocked in hardware and janitorial supply shops in our industry section for Janitorial Supplies.